•	Fifteen of the 20 most polluted cities in the world are in India. 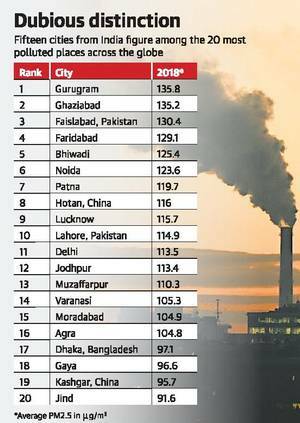 •	Gurugram led all cities in pollution levels in 2018 with Ghaziabad, Faridabad, Noida and Bhiwadi in the top six. •	India`s national capital region (NCR) emerged as the most polluted region in the world in last year. •	The latest data compiled in the IQAir AirVisual 2018 World Air Quality Report prepared in collaboration with Greenpeace Southeast Asia, reveals the state of particulate matter (PM2.5) pollution last year. •	Out of the 20 most polluted cities in the world, 18 are in India, Pakistan and Bangladesh.